Achieve your life goals faster using the advanced features that only BinaryPlus offer. 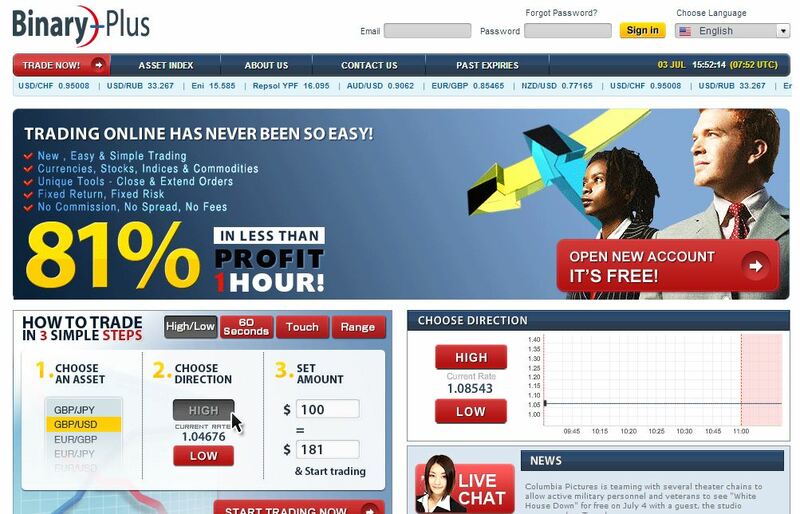 This binary options broker review takes an in-depth look at this impressive trading platform. This premier option trading platform allows anyone to trade binary options easily. With its user-friendly website, this broker provides astounding money management features that no other platform offers. BinaryPlus has an extensive asset index, allowing its users to choose their preferred assets from a list of hot assets. It currently offers 11 currency pairs, 7 indices, 10 stocks, 6 commodities, and a bond. With a minimum trade amount of just $/€/£10, this platform allows anyone to start trading and earning. On the other hand, its current maximum trade amount is set at $/€/£1,000. This doesn’t limit the number of trades you can make though. Traders, both beginner and experts alike, are enticed in this platform because of its huge payouts ranging from 65-81% for trades ending in-the-money. One quick and less risky way to test these payout percentages is through BinaryPlus’ free demo account. This broker uses the most common trade types in the industry – High/Low, 60 Seconds, Touch, and Range. Aside from these standard trade types, BinaryPlus review also features unique functions such as close and extend. This gives users the power to close their options even before the expiry time arrives. Likewise, this enables traders to automatically extend the expiry times of their trades after purchase. Though BinaryPlus only accepts USD as of the moment, it offers various ways to withdraw your earnings. This includes refunding your credit card, wire transferring to your bank account, and sending a check to your billing address. This broker doesn’t require any minimum withdrawal amount, so users can withdraw any amount they desire. Moreover, it allows cancellation of withdrawal requests as long as the users haven’t received the withdrawal approval via email.